Students’ skills are assessed at the beginning of the program and are put into the appropriate challenge level. Returning students move to the next challenge level in the robotics program. Students in Grade 2 who have already gone through our program using WeDo 1.0 and students Grade 3 get a taste of basic engineering, robotics and programming principles through LEGO® Education WeDo 2.0. This LEGO Robotics curriculum also incorporates a wider range of important science topics such as recycling, forces of nature, and others. While still using a drag-and-drop interface, LEGO WeDo 2.0 allows students to power their LEGO projects using a Bluetooth hub which in turns connects to motors and sensors. 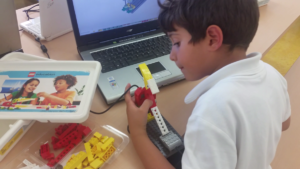 Students in the LEGO WeDo 2.0 program are required to come up with solutions to building problems and complete a number of science related challenges. For this reason, in our classrooms students are encouraged to work in pairs, in support of collaboration, communication and team building skills. The LEGO Mindstorms Robotics + Programming introduces students to design and programming challenges with robots using the LEGO Mindstorms Education NXT and EV3 sets and visual programming software. Students develop critical thinking, problem solving, teamwork and digital literacy skills through the various robotic challenges presented in the course. LEGO Mindstorms Robotics + Programming has 4 levels: 1. Robot Educator Tutorials (a. Hardware, b. Basic, c. Beyond Basics), 2. 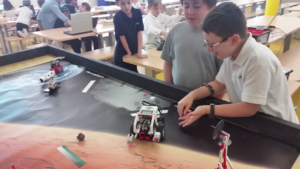 EV3 RoboCamp Tutorials OR NXT Program Activities, 3. FLL/GearBot Mat Challenges, 4. Advanced Programming Challenges. Students are assessed for robotics skills at the beginning of the program and are put into the appropriate challenge level. Returning students move to the next challenge level in the robotics program. Grade 3 students with advanced math skills and experience in Scratch or Mindstorms Labview programming can be considered to join this stream.